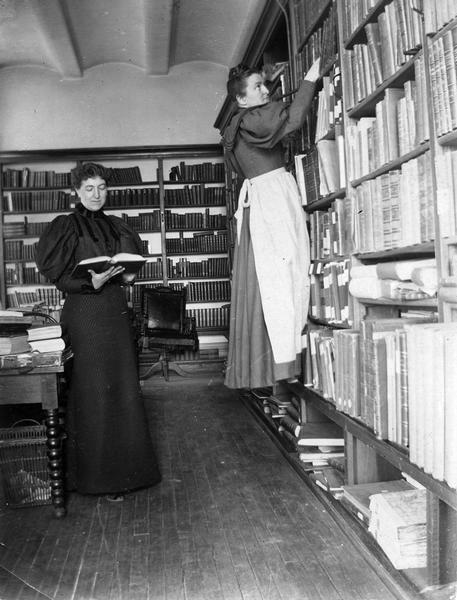 Minnie Oakley and Florence Baker Hayes (reaching for a book), two Historical Society librarians, during the period when the Society was housed in the South Wing of the Wisconsin State Capitol. Details of the Capitol furnishing and construction in this photograph include the leather swivel chair (in need of repair) and the Jenny Lind table, as well as documentation of the ceiling construction. See also Image ID: 23284 for another image of Minnie Oakley.